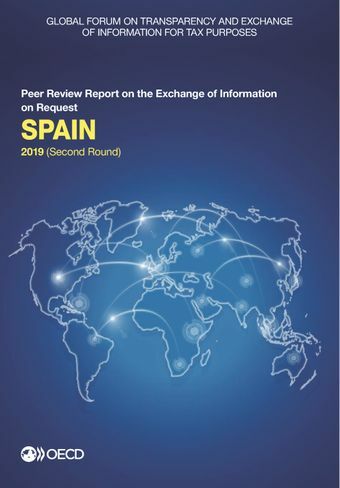 This report contains the 2019 Peer Review Report on the Exchange of Information on Request of Spain. Spain was rated overall Largely Compliant with the international standard of transparency and exchange of information on requests handled over the period from 1 January 2015 to 31 December 2017. The report concluded that Spain has efficiently exchanged information, responding in a prompt manner to over 1 700 requests received during the review period. Regarding the availability of beneficial ownership information, Spain’s AML framework contains a number of measures relating to the identification of beneficial owners of legal entities and arrangements, specially by Notaries and Financial institutions. These already existing obligations have been recently accompanied by the obligation of entities to annually submit beneficial ownership information to the Commercial Registry. The main area where improvement was recommended in the report, relates to Spain’s system whereby a significant number of inactive companies which do not comply with their filing obligations remain with legal personality on the Commercial Registry, as this may affect the availability of beneficial ownership and accounting records for these entities.